Thin is in! A SW1911 Pro Series with Kim Ahrends Thin Grips and a Crossbreed SuperTuck Deluxe offers comfortable, deep cover concealment. 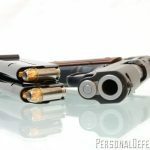 The concealed carry handgun market has its share of tiny guns in small calibers and reduced capacities. These guns can fit in your pocket, in an ankle holster or in other creative hideouts on or about your person. 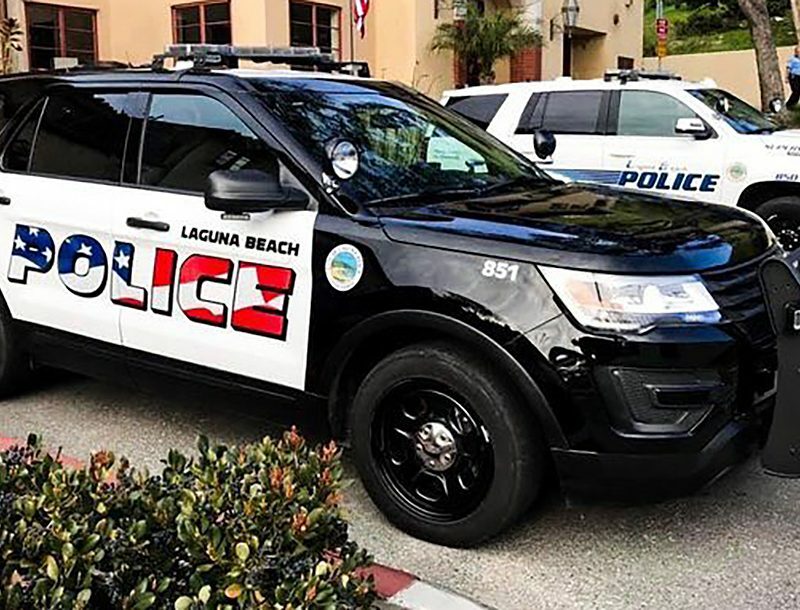 Sometimes, however, you long for a concealable handgun that actually fills your hand and carries several rounds of a very powerful caliber. Deep down inside, you might even want that handgun to be a 1911. 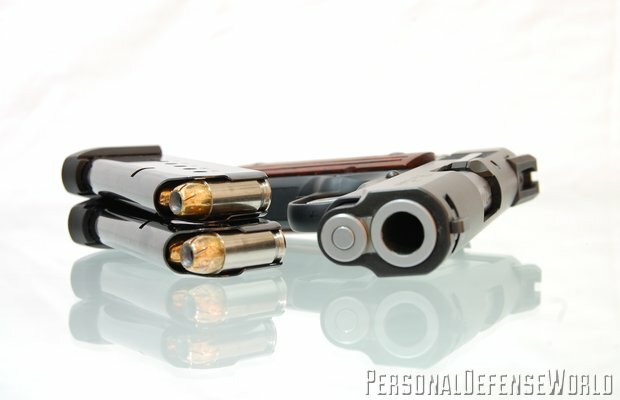 While some 1911 aficionados claim to be able to easily conceal full-sized, 5-inch-barreled Government models, concealment only gets easier as the physical mass of a weapon decreases. 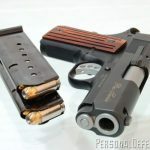 So a Commander-sized 1911—with the shorter 4.25-inch barrel—is concealed more easily than the larger Government model. 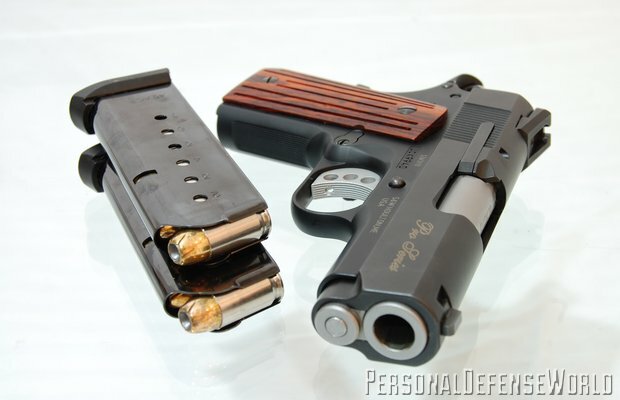 Likewise, 3-inch-barreled 1911s should be even easier to hide. 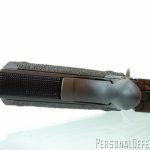 While 3-inch barreled 1911s are a significant departure from the original design and are considered heretical to 1911 purists, with three helpful accessories, they offer some key advantages that enhance their ability as deep-cover concealment weapons. 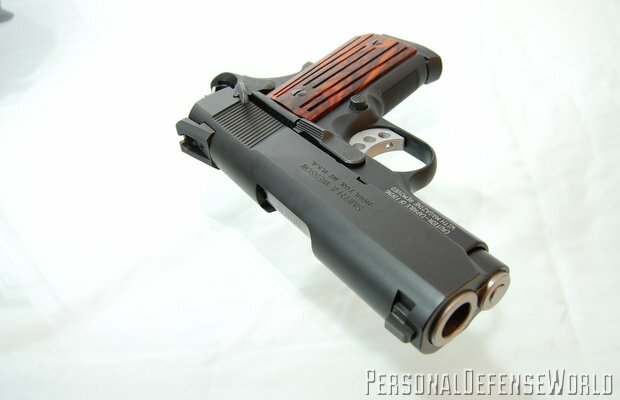 Several manufacturers offer 3-inch-barreled 1911s. 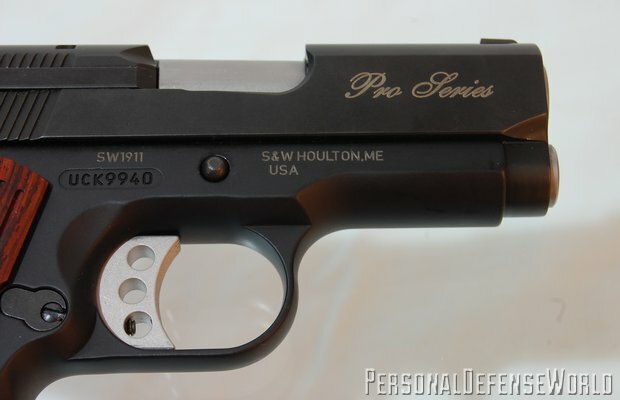 For this article, I acquired a Smith & Wesson SW1911 Pro Series. 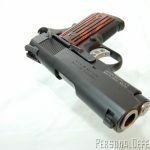 At $1,159, it is a better-than-stock-but-not-quite-custom 1911 that weighs only 26.5 ounces and comes with some very nice features. For example, the manual safety is one-sided which saves some space and helps prevent the accidental disengagement that might result in a deep-cover carry situation. The gun’s synthetic grips are excellent, offering a rubber-like, textured surface that looks tactical and durable. 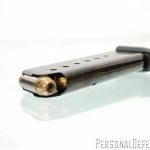 Somewhat unfriendly to deep-cover concealment, however, are the S&W Pro Series seven-round magazines, both of which come with baseplates that extend about an eighth of an inch beyond the bottom of the stocks. Other than that, the Pro Series is thin (under 0.88 inches wide) but robust. It feels good in hand, draws well, and points instinctively—just like a 1911 should. Before making any alterations to the S&W Pro Series, I wanted find out how this gun would do right out of the box with a traditional deep-cover concealment technique—carrying it in a belly band. Often nothing more than an elastic pouch sewn into the side of a wide elastic strap and wrapped around the torso, belly-band users often praise their simplicity and versatility while bemoaning the lack of comfort due to tightness or the often-irritating fabric that rests against a user’s skin. 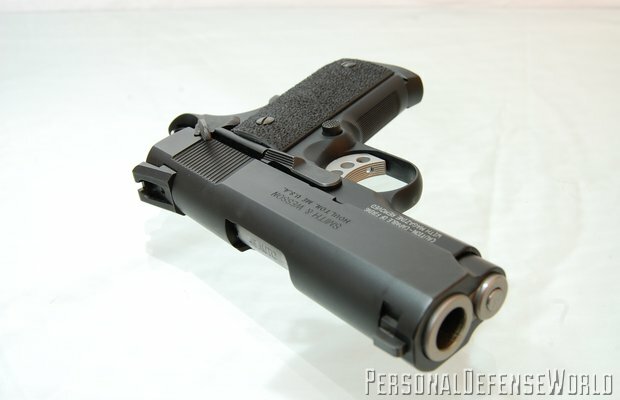 Moreover, the S&W Pro Series, while sporting mostly smooth edges, is nonetheless a 1911 and thereby consists of several features with sharp points or parts that tend to dig into one’s skin when using a belly band. In addition, the rough-textured synthetic grips of the Pro Series, while offering excellent purchase for the hands, would feel like sandpaper against any other skin. Enter the PT-ONE belly-band holster by Pistol Wear. Made of a stretchy, thick fabric that reminds me of neoprene, the PT-ONE felt soft and strong and secured around my torso with three snaps. Correctly sizing the PT-ONE forces you to undo the hook-and-loop attachment, put it on your torso, and then secure it. You only have to do this once, however, and then you use the three snaps to take it on and off, a simple procedure. Pistol Wear recommends you wear the PT-ONE around your waist and not around your belly. 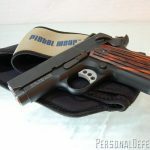 Still, its design offers more than one way of hiding a handgun and more than one way of wearing it. For example, a right-handed shooter who wants to carry the Pro Series at the 3 or 4 o’clock position (strong-side draw) can use the PT-ONE as a sort of inside-the-waistband (IWB) holster. In this way, the holster offers a much deeper cover than a traditional IWB holster as a shirt can be tucked in over the weapon and PT-ONE. Used like this, the Pro Series muzzle points down but provides some ability to change the cant. Move the holster pouch to the front of your waist to carry a gun at 1 or 2 o’clock (appendix carry). Or move the holster to carry at 9 o’clock (weak-side draw). Or move the holster to 5 or 6 o’clock (small of the back carry). No matter the position, the Pro Series carried well in the PT-ONE and always felt comfortable and secure. The PT-ONE pouch also offers a sort of retention strap that could wrap around the Pro Series grip, under the beavertail. Or just tuck the strap in if it’s not desired. Additionally, the PT-ONE includes a separate compartment for a spare magazine. In addition to carrying the Pro Series with the muzzle pointed down, the PT-ONE holster allows you to carry a gun with the slide horizontal. Carrying the Pro Series in this manner results in the gun disappearing completely under the fabric and this proved to be the best method for carrying the Pro Series when physically active, such as when running for exercise. 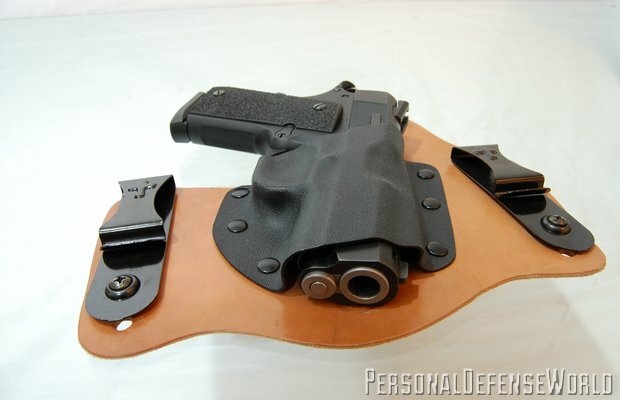 This is actually the PT-ONE holster’s main selling point—it is a safe and comfortable holster to use during exercise. Using the PT-ONE holster in this way brought two factors to the fore: comfort and safety. Whether carrying while exercising or just doing the normal activities of life, the holster proved very comfortable, regardless of the position in which I stored the Pro Series. Moreover, the Pro Series never felt like it was insecure or about to fall out. Indeed, the PT-ONE allowed some breathability for me as well as the Pro Series. 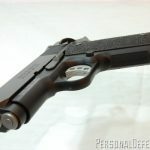 I’m unsure about the long-term effects of sweat and moisture on the Pro Series—frankly, the Melonite finish and regular maintenance and cleaning should be enough to mitigate against rust—but its standard synthetic grips at least ensured a good grip, despite any moisture that appeared on the gun. The PT-ONE has an MSRP of $37.99. In terms of concealment, especially when considering deep-cover carry, the most important measurement for a pistol may be its slide width. 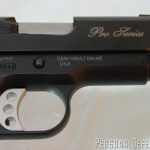 Although other handguns have thinner slides, the Pro Series (and most 1911s, for that matter) have a slide width of just under 0.88 inches. 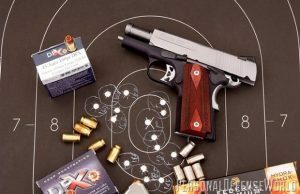 With a 1911, the manual safety obviously adds to the width, but not in any meaningful way. 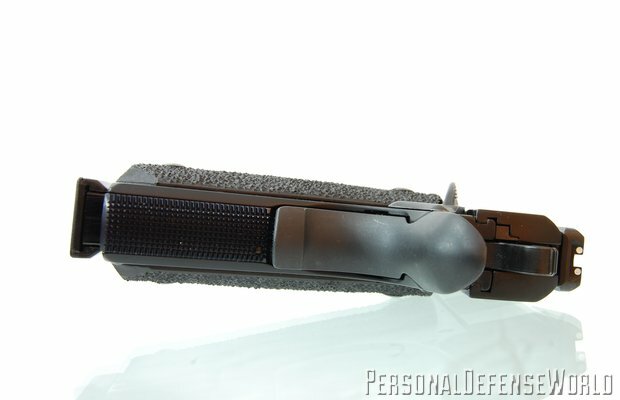 Out of the box, the stock Pro Series grips gave the gun an overall width that was significantly greater than 1 inch. 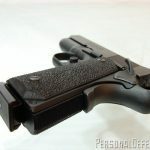 Since the stock grips on the Pro Series are excellent, I questioned whether finding thinner grips would truly aid in the deep-cover concealment of this handgun or just be superfluous. Still, I wanted to get that overall grip measurement as close to an inch or less as possible, so I acquired a pair of Kim Ahrends Thin Grips. 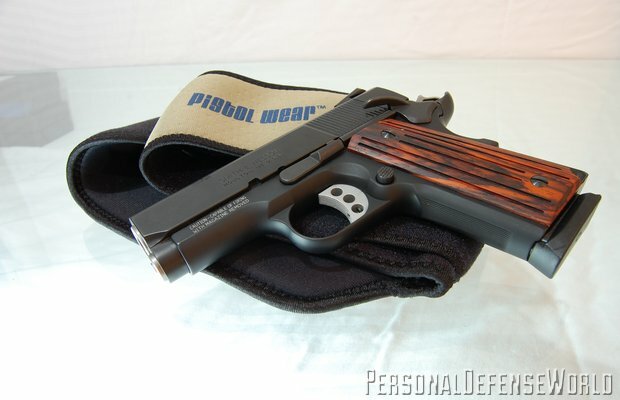 These beautiful rosewood grips are thin enough that they come with their own set of screws and bushings. Installation required removal of the Pro Series stock screws, then the grip panels, and then the stock bushings from the frame. The Kim Ahrends bushings screwed right into the Pro Series frame, the rosewood panels fit perfectly over the bushings, and the new screws seated securely. While not as hand-filling as the stock synthetic grips, the Kim Ahrends are “serrated” for excellent purchase. And while the Pro Series looks great with its stock synthetic grips, it is simply stunning with the Kim Ahrends Rosewood Thin Grips. 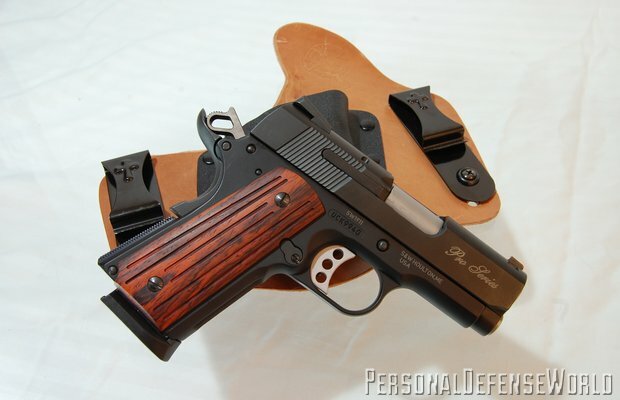 It’s an ironic shame that these grips are ever concealed by holsters, clothes, or hands. 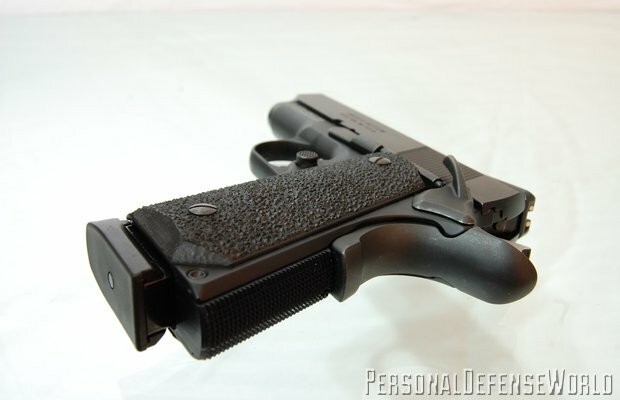 But back to concealment: With the Kim Ahrends grips installed, the Pro Series measured just over 0.88 inches wide and provided excellent purchase. I’m not sure I would use any wood grips when carrying in the PT-ONE, especially if I’m going to be sweating. 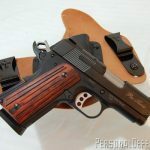 A thin-gripped Pro Series 1911, however, makes more sense when carried strong-side, inside-the-waistband, in a very thin but strong and comfortable holster. The Ahrends Thin Grips only cost $50. Crossbreed Holsters are enjoying significant success in the marketplace and rightfully so. They are effective at safely and comfortably concealing and holding a firearm in the ready position. 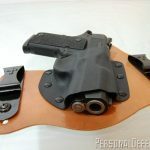 The Crossbreed SuperTuck Deluxe, the company’s flagship model, is a leather and Kydex concealment holster with belt clips that accommodates a shirt tucked over the top of it. 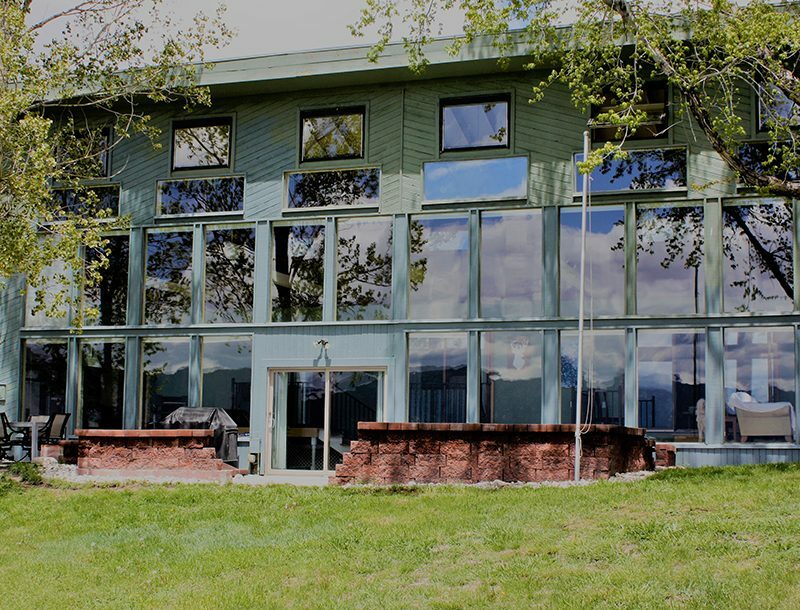 Although its size and construction look uncomfortable, it is exactly those factors that make it very comfortable for concealed carry. Moreover, you can adjust the SuperTuck Deluxe for ride depth and cant. As such, it should be able to accommodate your body and preferred mode of carry. The SuperTuck Deluxe’s seemingly large amount of leather serves to distribute the weight of a handgun and therefore increase comfort. The molded Kydex is custom-fit to whatever gun you intend to carry and engaged the SW1911 Pro Series positively. 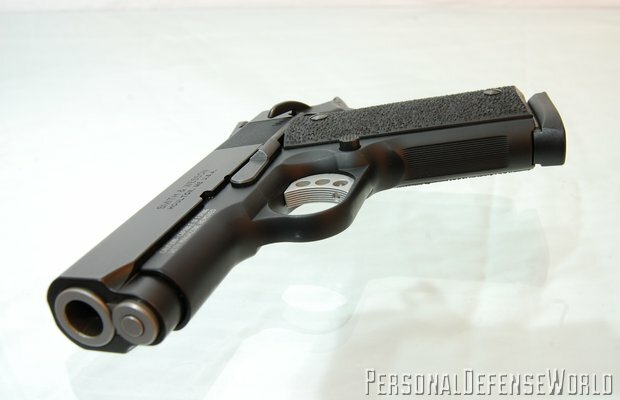 With its open-ended design, it also gladly accepted Commander and Government 1911s as well. The belt clips held securely to my belt, their wide spacing adding stability to the entire rig. 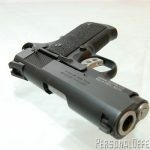 The S&W SW1911 Pro Series equipped with the Kim Ahrends Thin Grips disappeared under a tucked-in shirt and felt great. While I could carry the SuperTuck Deluxe at 3 or 4 o’clock, I couldn’t go any farther up or down the clock, so to speak. But I didn’t want to. As it was, I had a secure, hidden holster carrying the Pro Series on my strong side. 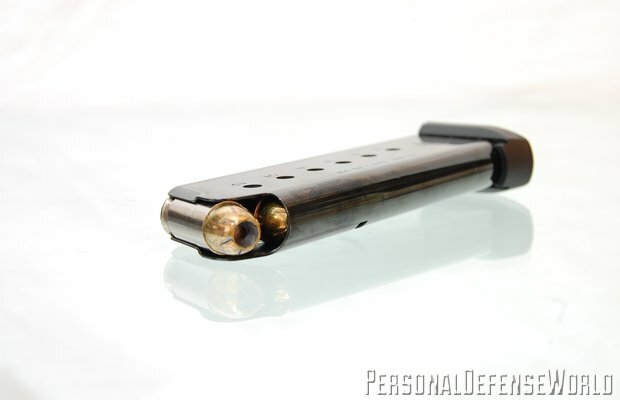 A spare magazine with seven rounds of .45 ACP went into my front-left pants pocket. This accessory has an MSRP of $69.75.